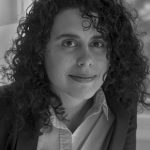 Devise Literary, a site spearheaded by emerging fiction writers Alexandra Stanislaw and Drew Wade, originally began as “a way to gather resources for writers.” However, since its initiation in 2015, the site has already evolved to include a seasonal literary magazine open to creative work and literary criticism. One of the crucial elements of online literary magazines is the aesthetic of the website. These visuals serve as a stand-in for the tactile experience of flipping through a crisp, thoughtfully laid out volume. Stanislaw and and Wade seem to be aware of this stylistic concern; the website is a beautiful minimalist theme of black and grey, with orange accents. And it is easy to navigate, whether searching through their recent issues (all publications are listed both by volume and genre) or writer resources. the soft edges of time. Don’t you think it’s time for love? Let’s walk to the middle of the ocean. White roses sing and sing. As to the type of work Stanislaw and Wade are looking for, their submission page suggests Devise Literary is geared more toward emerging writers, those less experienced in differentiating between various literary magazine aesthetics (something which is often mystifying even for the most experienced writers). Devise Literary is still an emerging entity, merely one year old, and so the page for literary magazine reviews in “Writer Resources” is still under construction. The editors are seeking contributors interested in writing literary magazine reviews, along with book reviews, writing advice, and prompts. 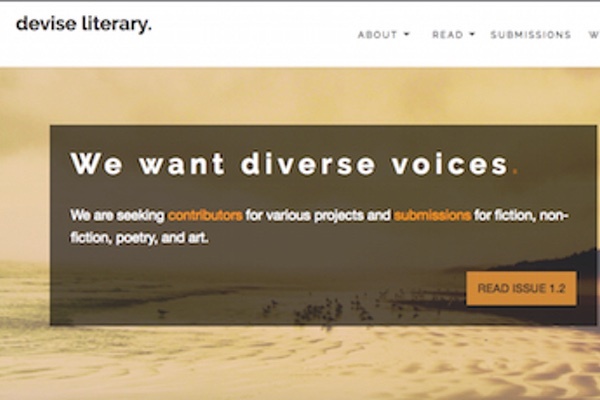 While it is unfortunate that these resources are not yet up and running, Devise Literary’s call for contributors seems like yet another opportunity for emerging artists to gain exposure. I’m excited to see how this site will continue to develop.